Rain Gutters protect more than just your roof! Gutters are attached to roof edges and channel rainwater away from your house and its foundation. They are obviously an essential part of your roofing system, and at Roofing Doctor we want to make sure that not only is your roof in excellent shape, but that your gutters are working properly. Leaky gutters can do as much damage as a leaky roof. Gutters are made from aluminum, copper, zinc, vinyl, wood, and all the variations of these materials. Choosing the type of gutters that are great for your home can be confusing, and depends mostly on your budget, aesthetic preference, and climate. Gutters cost anywhere between $1-$12 per linear foot. If you want to uphold the authenticity of your historic home, you might want to choose wood gutters. If you live in a climate that experiences extreme precipitation, galvanized steel is an excellent option. There are many nuances you have to consider when choosing gutters for your home. At Roofing Doctor, we will be happy to discuss the best option for you. Call or email us for a free consultation and estimate. Leaf Relief® Guards helps keep your gutters free from clogs and overflows with a patented design. It allows water to flow freely, while breezes simply blow leaves away. Fitting these over gutters, keeps out leaves, pine needles and other debris that can cause clogs. The concept of gutters has been around for thousands of years, although gutters as we know them today did not become popular until the 1800s. Before technology and mass production made metal and plastic gutters the more common and cheaper choice for homeowners, wooden gutters were the norm. Wood is a much more aesthetically pleasing material, and is a great choice is you want to uphold the authenticity of your historic home. However, wooden gutters are more expensive, harder to take care of, and harder to install. Since wood is a much more fragile material than metal, wooden gutters are also more prone to rotting and damage than other types of rain gutters. However, if properly cared for, your wooden gutters should last a lifetime! Redwood contains natural oils that help repel water and resist rot and other water damage. 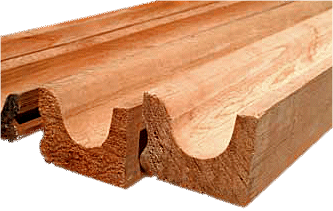 Although redwood is usually the most common choice for gutters, cedar, pine, and Douglas fir are also on the market. Redwood and cedar are also usually the most expensive. Wooden gutters commonly measure 4 x 6 inches, and are sold in 10- and 20-foot lengths. However, you can get custom-made gutters of any size to suit your home. Roofing Doctor has more than 19 years of experience in installing all kinds of wooden gutters, and we will also provide you with instructions for how to care for your rain gutters to ensure that they will last for decades. Call or email us for a free estimate or consultation. Gutter screens come in aluminum, zinc, vinyl, and composite materials.